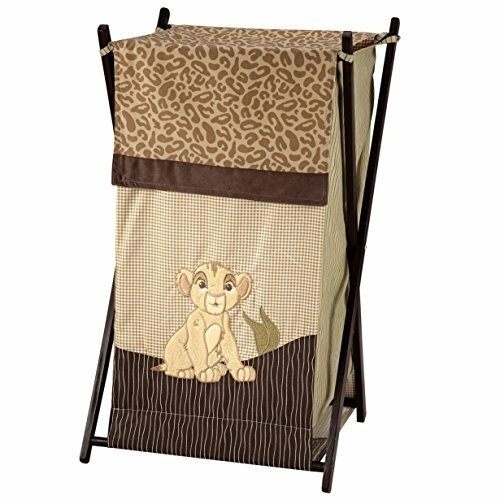 Disney Baby - Lion King Hamper helps to keep your nursery organized. Wooden frame folds flat for easy storage and includes a removable mesh liner for easy access. The body of the hamper comes in a combination of stripes and animal prints. Detailed with Simba applique sitting among the jungle leaves. Coordinates with a full line of Lion King Nursery Bedding. Keep your nursery organized in style with this Lion King hamper. Detailed with textured applique and embroidery. The Lion King Hamper measures 13 x 25 x 13". Made of 65% Polyester 35% Cotton fabrics.